Step into a world of legend. Medieval tales of knights and chivalry still thrill us today. From the fall of Rome to the birth of the Renaissance, the medieval era transformed Europe. Innovations, from the Magna Carta to the founding of universities, continue to shape our modern world. 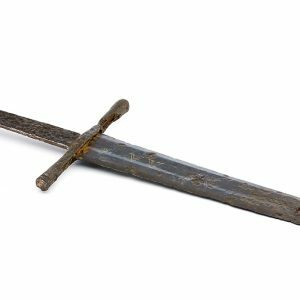 Over 200 treasures from the world-renowned British Museum, many never before seen in North America, conjure a world of deadly power struggles and spectacular romance. An exhibition developed by the British Museum in collaboration with the Canadian Museum of History. Photo: Figurine of a Knight, England, 1375–1425, stone. © The Trustees of the British Museum. All rights reserved. 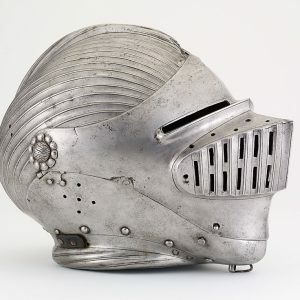 Armet HelmetThis type of helmet was most popular between 1475 and 1525, when plate armour was at its height. 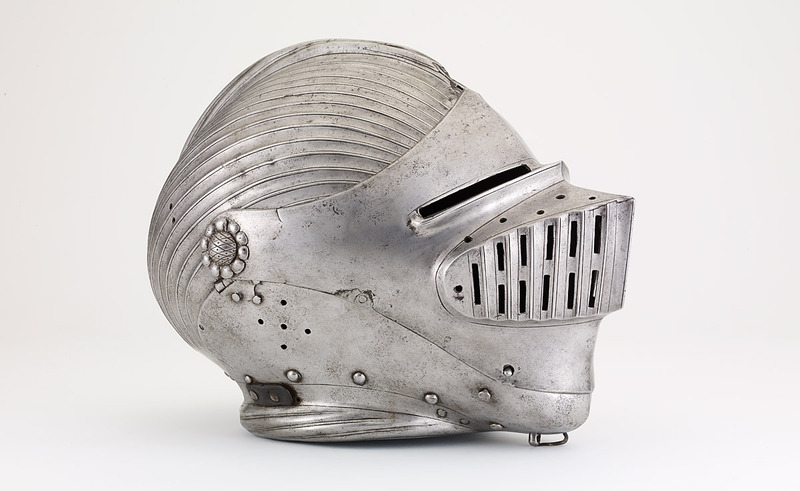 It completely enclosed the head, and its grilled visor gave the wearer a balance between vision and protection. It was used exclusively by knights wearing full suits of armour. By the end of the Middle Ages, the use of guns and cannons made wearing plate armour for protection useless. 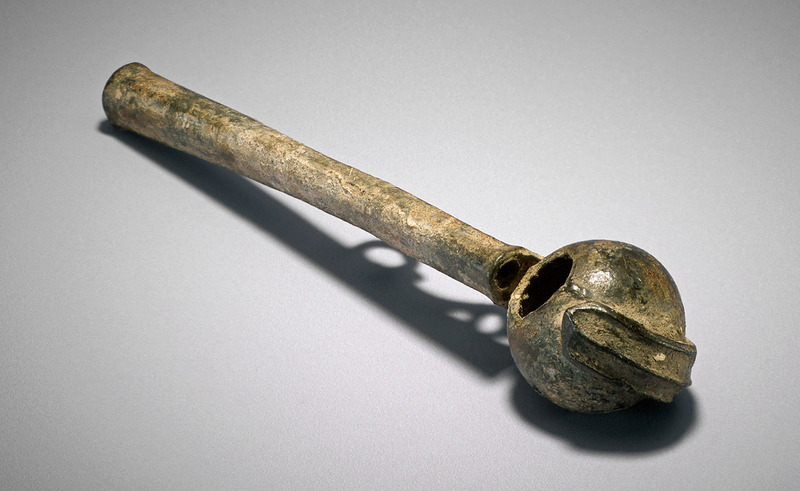 Photo: © The Trustees of the British Museum. All rights reserved. 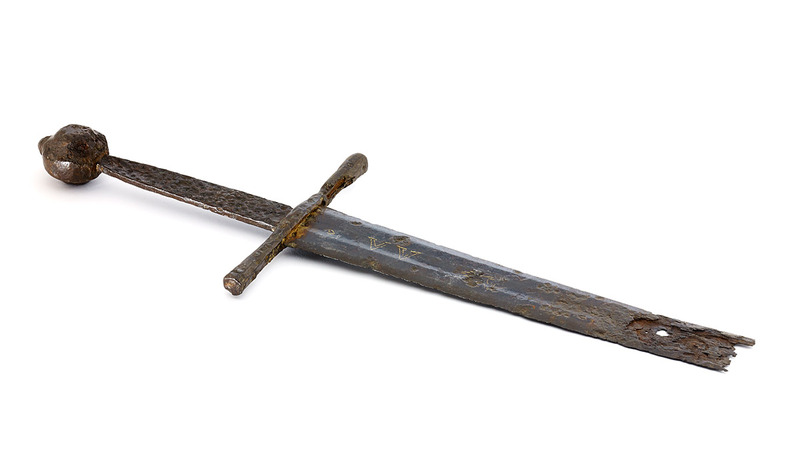 SwordThis fragment was originally part of a long sword, which was designed to be used on horseback, the momentum of the charge enabling the rider to deliver a stronger blow. Inlaid with copper alloy, the blade is engraved on one side with a heart and the letters VV; the other depicting a running animal, possibly a wolf. 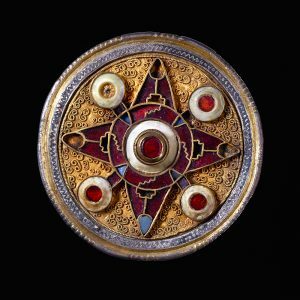 The Wingham BroochThis intricate brooch is of a type popular during the 500s and early 600s in Kent, an Anglo-Saxon kingdom in present-day South East England. 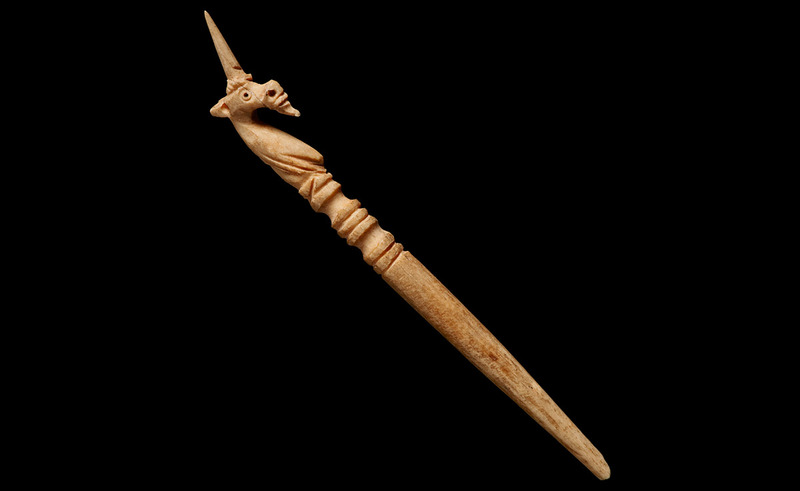 Kent forged healthy trade and diplomatic contacts with Frankia (centring on modern-day France and parts of Germany). This brooch is a testament to the kingdom’s increasing wealth and status. 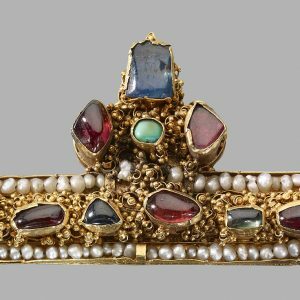 Crown FragmentFew medieval crowns survive today, as most were destroyed or refashioned. 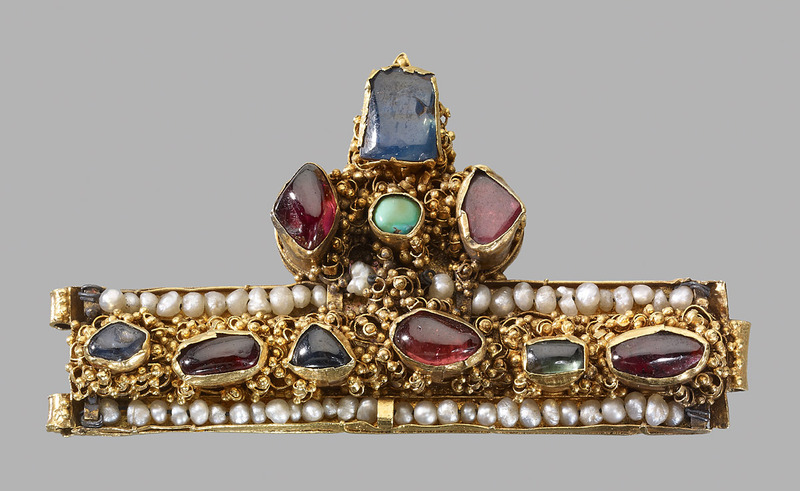 This delicate fragment comes from a crown that would probably have been worn by a woman. The range of precious gemstones, sourced by merchants trading beyond Europe, reveal the splendour in which monarchs lived. 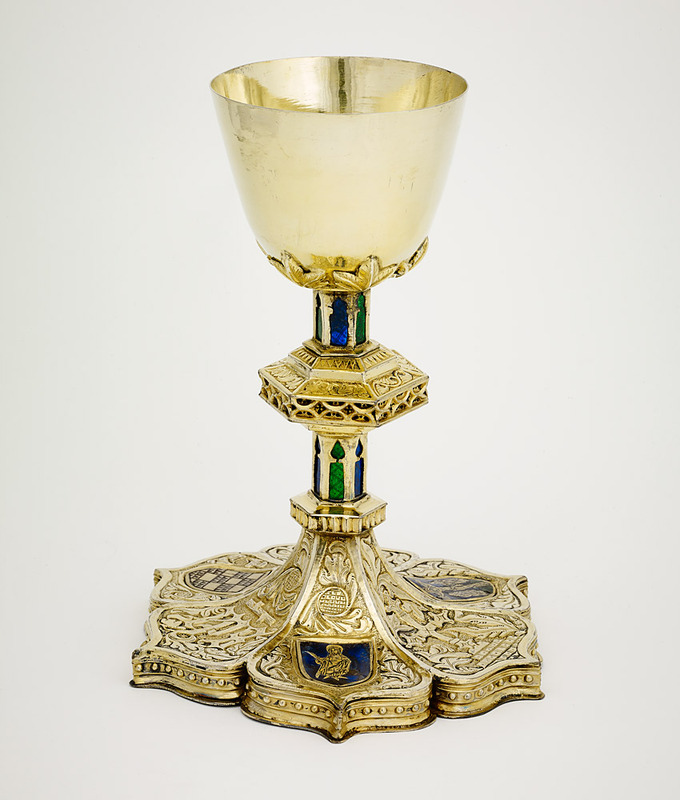 ChaliceThis chalice was said to have been given by Count de Velasco (1425–1492) to a religious hospital in Spain. 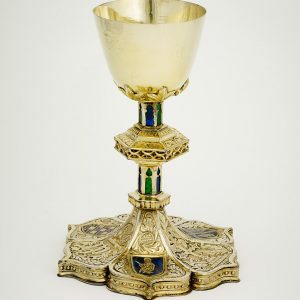 Although the blessed wine held in such vessels was shared, the moment of its consecration was concealed from worshippers by a wooden screen, imbuing a sense of the miraculous. Papal RingThis ring is associated with Pope Pius II (r. 1458–1464), who would also have had representatives in the royal courts. It bears the arms of his family (Piccolomini), with the keys of the Holy See, and the inscription PAPA PIO (“Pope Pius”). 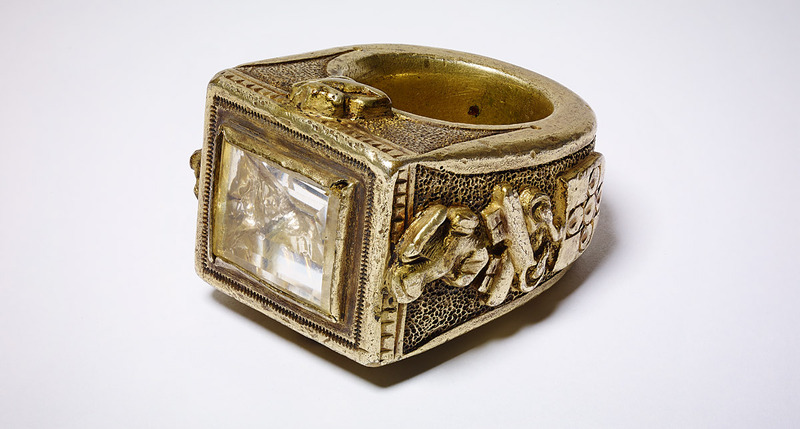 The size of the ring and the prominent display of the insignia suggest it may have been worn on the gloved hand of a papal representative. PolycandelonLight was used throughout churches: sunlight flowed through coloured stained-glass windows and lamps and candles burned. 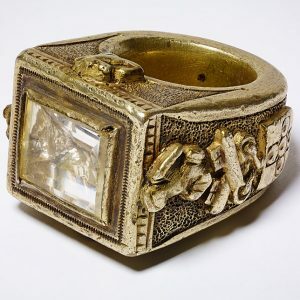 Many churches close to the Mediterranean were adorned with light-creating objects, such as this polycandelon, which held oil-filled glass vessels in its round openings. Falcon WhistleBirds of prey were favourite pets of the wealthy. Contemporary books advised which breeds could be owned by different levels of the nobility. 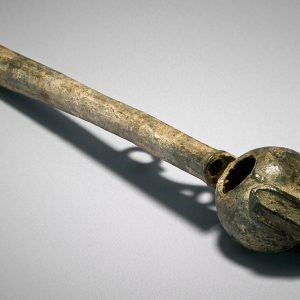 This whistle would have been used to control the movements of the bird when hunting, and to call it back from long distances. 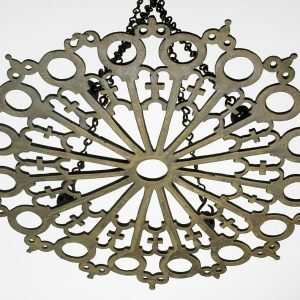 It is believed that Henry VIII gave Anne Boleyn a gold whistle pendant as a love gift. 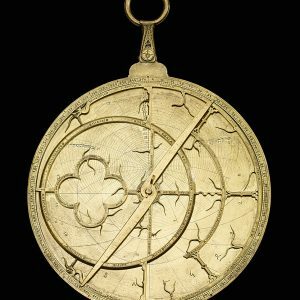 AstrolabePerfected in the Middle Ages by Muslim scholars, the astrolabe spread across the courts of Europe. 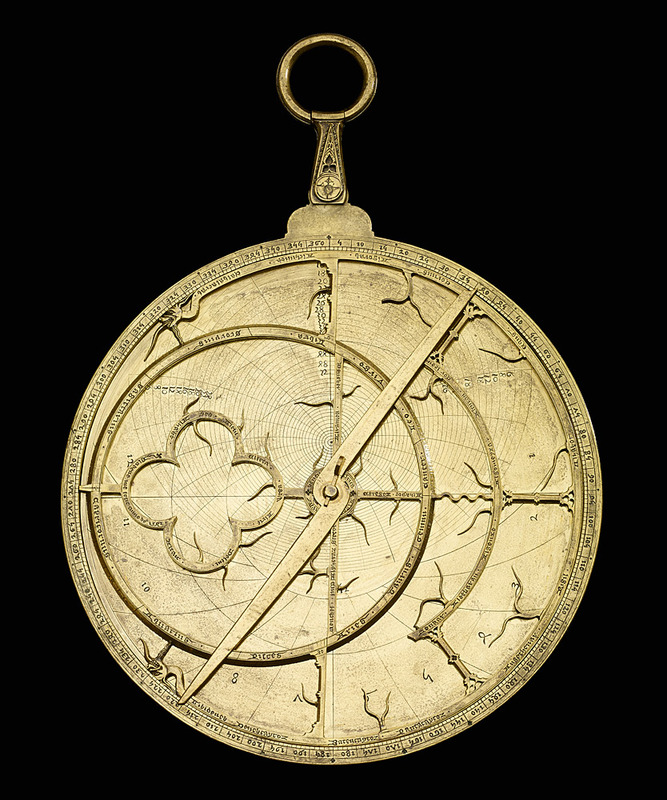 It was designed to tell the time during the day and the night, and had a star map to aid surveying and astronomy. This example is inscribed in Latin with the name of the English maker, BLAKENE. 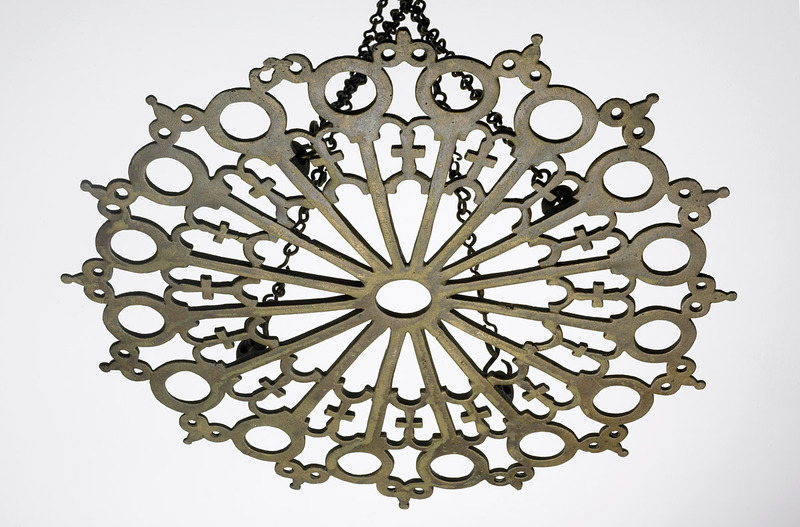 Beautiful and useful, astrolabes are often listed in the possessions of princes and courtiers. 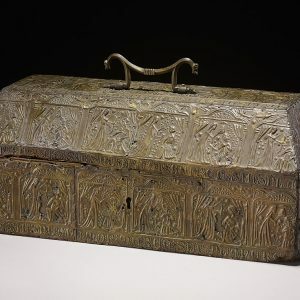 Casket with Romantic ScenesCovered with typical scenes of medieval courtship, this casket shows rows of couples in curtain-framed compartments in different romantic poses. 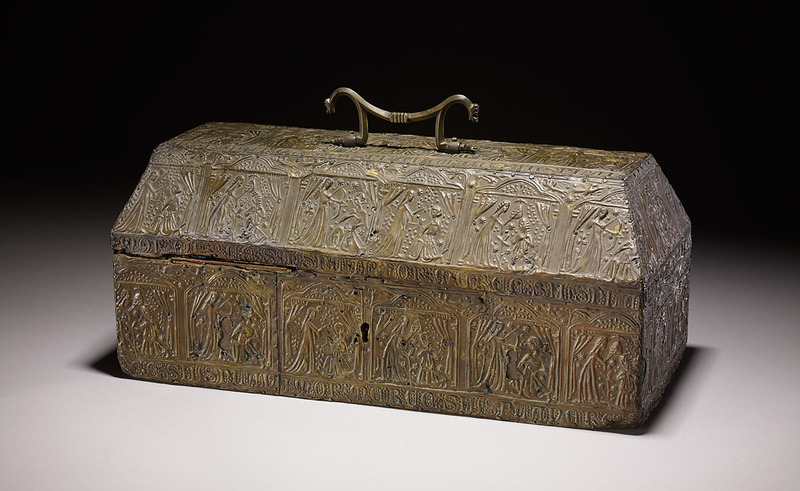 The romantic imagery and size of this casket suggest that it would have been used to carry the valuables of a woman. 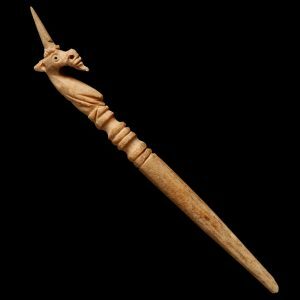 Pin with a UnicornCarved in bone, this pin terminates in the delicate head of a unicorn, a symbol of grace. Contemporary writers described how unicorns, because of their purity, could only be captured or tamed by a virgin maiden. The wearing of this miniature unicorn by a woman was perhaps a public statement on her virtue. 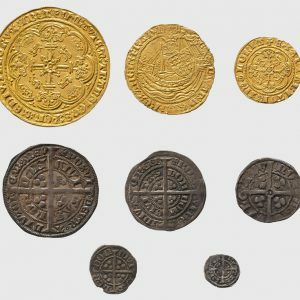 All dating from the reign of King Edward III, these coins show the range of denominations used in England during the 1300s. Used for day-to-day transactions, an established coinage created economic stability. 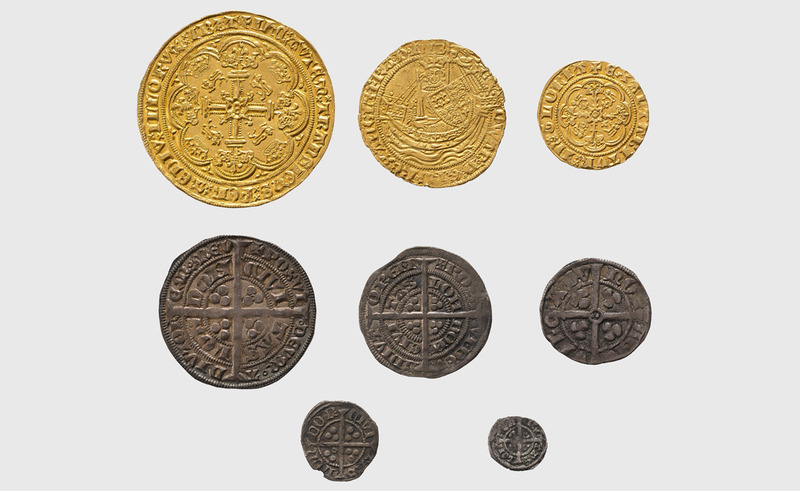 These coins bear Edward’s image and name. During his reign, Edward III used steady taxation to fund wars with France, for which large quantities of new coins were needed. Complete your visit by picking up the Medieval Europe souvenir catalogue, on sale online and at the Museum Gift Shop.